SONY Bluetooth Deck!! Connect with Bluetooth, 3.5mm, and USB!!! Includes Marine Cover. 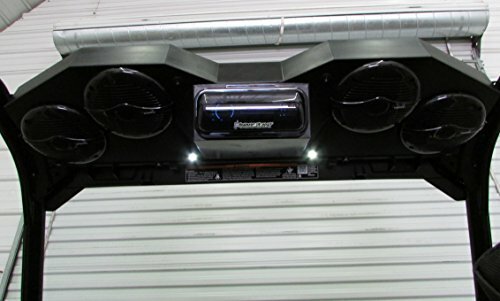 Has 4 Boss Marine 6.5" speakers!! Boxes are made with Impact Resistant Polyethylene (Plastic)! Unit is filled with poly fill for best sound quality, and all mounting hardware is stainless!!! Fits Can Am Maverick and Commander!!! ********DOES NOT FIT X3*********** Mounts between rollbars in factory cage with included clamps.Includes all wiring and mounting hardware. SD Does Not Work With MP4 Format Only MP3 There will be a 10% restocking fee on all stereo's that are returned, unless defective. A 35% restocking fee will be charged if the stereo is installed. Buyer must pay return shipping as well. AUX, MP3 devices, 3.5mm input, Bluetooth, USB, NO CD PLAYER. If you have any questions about this product by Galena, contact us by completing and submitting the form below. If you are looking for a specif part number, please include it with your message.